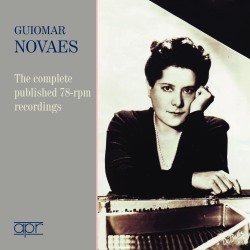 Except for more specialist listeners, Guiomar Novaes’ lustre has receded somewhat since the days when her LPs were regularly admired. Yet she went back further than the vinyl age. Her first recording was made for Victor in 1919 and this is the line pursued by APR in its restoration of her complete 78rpm legacy, stretching from 1919 to 1947. She was born in São João da Boa Vista in 1895, the seventeenth of nineteen children. She clearly had good teachers there, before studying in Paris – one, Luigi Chiaffarelli, was a pupil of Busoni and the other, Antonietta Rudge Miller, who was only a decade older than Novaes, also made recordings and was much admired by Rubinstein. Incidentally Rudge’s husband, Charles Miller was the Englishman responsible for bringing football to Brazil. The question of Brazilian pianists, from Novaes and Rudge on to Nelson Freire - who learned much from Novaes - and beyond is a fascinating one in itself. Though it’s her Vox LPs, starting in 1949, and some for US Decca, Vanguard and the obscurer Fermata that have ensured her continued place in the pianistic firmament these Victor 78s, made between 1919 and 1927 and the Columbias which followed later between 1940 and 1947, preserve some of her most scintillating, brilliant, and characteristic playing. The great colourist made two recordings of Gottschalk’s Grande fantaisie triomphale sur l’hymne national brésilien. Appropriately so, as it was the first piece she played at her official debut at the age of eleven. The earlier recording is actually a composite of acoustic (horn) sides made in 1920 and 1923 and Victor re-recorded her in it electrically in 1927. This is her signature dish, a cavalcade of brilliant pianism with lashings of panache. It’s undeniably true that these early recordings are of relatively light fare. There is Gluck in hyphenated arrangements: Brahms in the Iphigénie en Aulide Gavotte, Friedman in the famous Orfeo ed Euridice. Here her tendency for exaggerated rubati can be heard, something also to be encountered in her 1920 Chopin Mazurka in D. Yet what also emerges, beyond some crudities of metrics, is freshness, verve, spontaneity and vibrancy very unusual to encounter in the recording studios of the time – or indeed any time. She seems completely unperturbed by the dreaded red light. For the best of her 1920s recordings you should turn to her Liszt. Gnomenreigen and Waldesrauschen are full of panache, commitment and digital control - technically outstanding examples of her art. There was something of a lacuna between her Victor and Columbia recordings – some thirteen years in fact. APR sensibly allocates each company a disc each. In this 1940-47 sequence she plays her French teacher Isidor Philipp’s charming Feux-Follets just as entrancingly as she had back in 1919 when she first recorded it – only this time in immeasurably better sound. There is just a single tantalising example of her Mompou - Jeunes filles au jardin. I’m not greatly taken by the Scarlatti brace or by her Couperin, which repertoire was always better in the hands of a pianist like Marcelle Meyer, who went deeper into it. I’m also, personally, not an admirer – though many are - of one of the few major works here, Bach’s Toccata in D major. Once again Meyer is much to be preferred, and so too the philosophical depth of Edwin Fischer. For all her technique Novaes sounds somewhat frivolous. Mozart’s Rondo barely survives a surfeit of daintiness and there are elements of daintiness in Chopin’s Ballade No. 3 as well, but romantic ardour too, thankfully. There is then the marvellous sequence of pieces by Villa-Lobos and Octavio Pinto (her husband) to admire. Villa-Lobos’ Popular Children’s Songs and As Três Marias are here, full of colour and vibrancy, as are excerpts from Prole do Bebê and Pinto’s Scenas Infantis. Here technique, glitter and colour and superfine characterisation are paramount. One lasting regret is that she did not record Goyescas or Iberia before her death in 1979; we have two tantalising movements from the latter – Evocación and Triana – and they suggest how much we have missed. She told Harold Schonberg she hadn’t the time to prepare Goyescas and that Pinto told her never to perform it in public. A pity. The fine transfers are by Seth Winner, and Jed Distler provides the sympathetic and helpful notes for this excellent twofer.